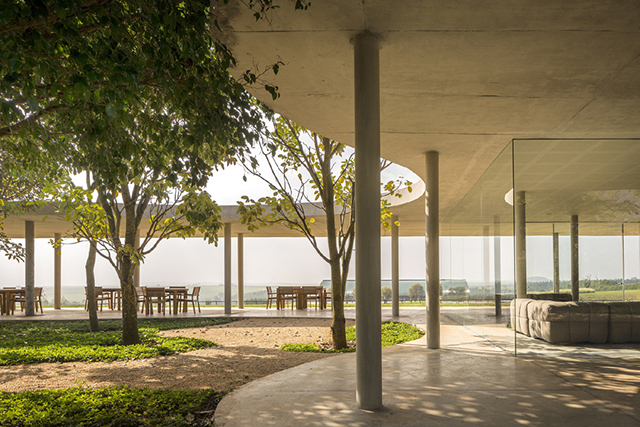 Brazilian architect Isay Weinfeld and his creative team have been building the Fazenda Boa Vista, a massive 1,800 acre residential and hospitality complex in Porto Feliz, piece by piece. 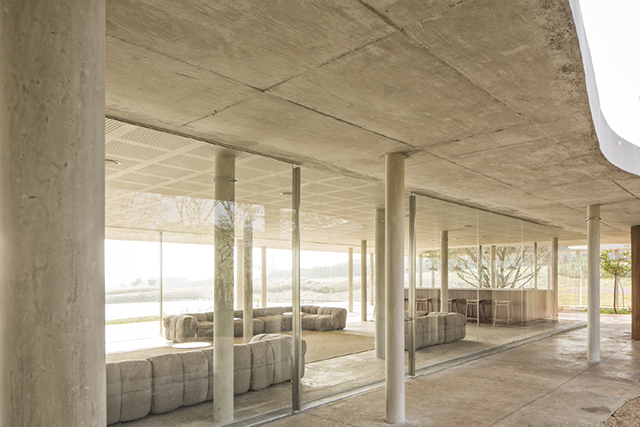 Last year we checked in with the architect for a brief update on the progress of the estate, when KNSTRCT featured the Fasano hotel at Fazenda Boa Vista and the Clubhouse, both elements of the complex. 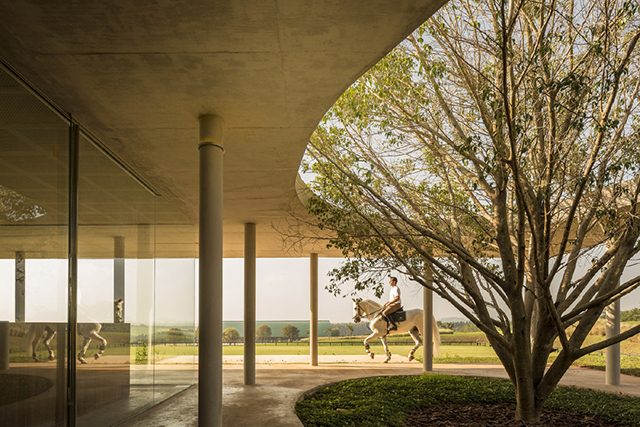 Now, Weinfeld has unveiled the stunning 7,000 square foot Equestrian Center Clubhouse, his most recent edition to the property. Large amoeba-shapes are cut out of the large fair-faced rectangular concrete top, which is being supported by a series of stilts. Under the concrete slab, three closed cubic volumes of space make up the locker rooms, kitchen, and lounge. The locker rooms and kitchen are housed in a wood cladded spaces for privacy, but the bar/lounge is enclosed by glass walls, which allow guests to enjoy a cocktail or snack while overlooking the equestrian competition track. 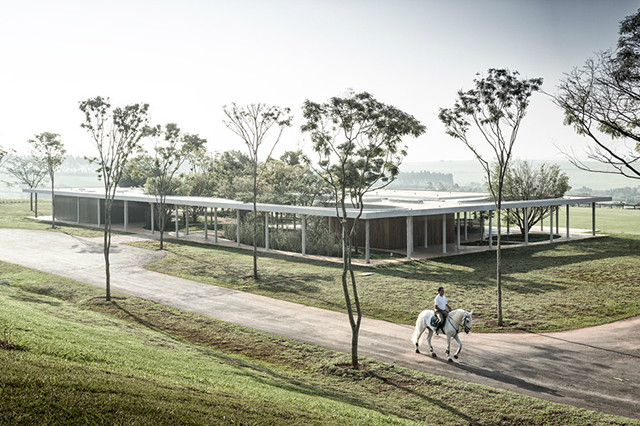 The architecture of Equestrian Clubhouse celebrates a closeness with nature as it is open and inviting. The openness of the space makes it possible for riders to interact with the clubhouse, even on their horse. 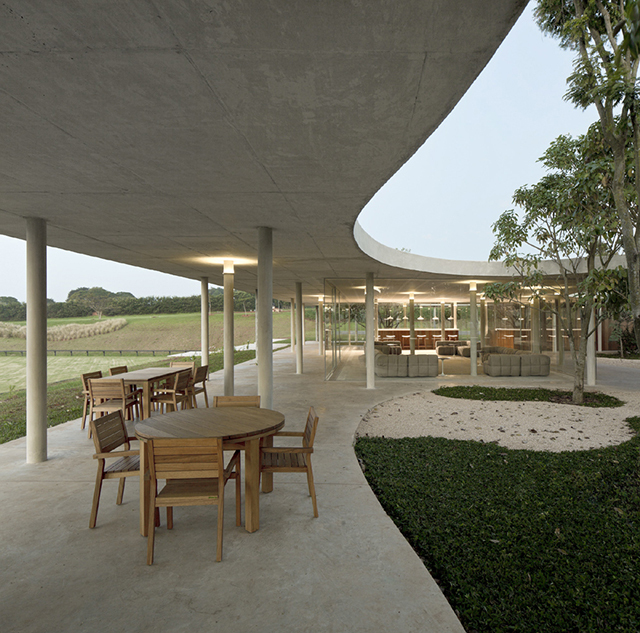 A series of curvy walkways make their way around the three spaces with open planters that are similarly amoeba shaped as the cut-outs in the concrete roof. Above the polished cement floors in the lounge are plush tan sofas and white tulip end tables, welcoming game spectators to sit, relax, and enjoy the performances.